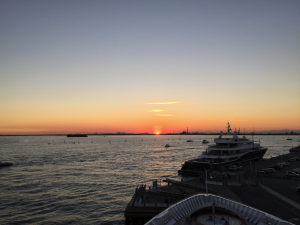 Laura and I recently had the opportunity to sail on the lovely Star Legend, one of Windstar Cruises’ power yachts, from Athens to Venice via the Corinth Canal. Two of the wonderful crew aboard Star Legend. Star Legend has just 210 passengers served by 150 crew members. We experienced such wonderful service, and of course the staff had fun with us being twins. They remembered our preferences in the bar and dining room, and we never had to ask for anything in our stateroom as it was always well-attended to. For a tour of the ship in photos, check out this slideshow I put together. The size of the ship allows Windstar to cruise in areas where the larger ships can’t go both in ports and waterways. The nine-day cruise had a fascinating itinerary, with gorgeous coastlines and ports with loads of history. All throughout the trip we heard of the various waves of occupiers and civilizations, including the Greeks, Romans, Venetians and the Ottomans to name a few. 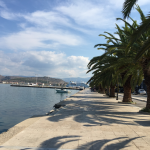 Our first stop was Nafplion, Greece, a seaport town which features attractive narrow streets with elegant Venetian houses and neoclassical mansions. One of the main points of interest is the Palamidi Fortress standing on a 216 metre high rock with three separate fortresses built within the citadel in the early 1700s. While we admired it from below, some of our fellow passengers climbed the 999 steps to reach the top. Star Legend transits the Corinth Canal connecting the Gulf of Corinth with the Aegean Sea. 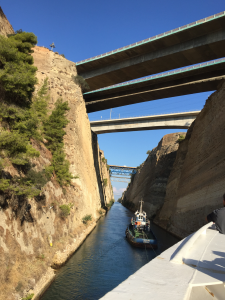 the Corinth Canal. The canal cuts through the narrow Isthmus of Corinth and separates the Peloponnese from the Greek mainland. No locks are employed in this 6.4 km long canal, which is only 21.4 metres wide at its base – making it impossible for most ships to pass through. At times we could almost reach out and touch the sides of the canal (and really appreciated the skill of the pilot boat and our own captain!). Once through the canal, we made our way to the fishing port of Itea, which was chosen as it is the gateway to Delphi, a UNESCO World Heritage Site on the slopes of Mt. Parnassos. The ancient Greeks considered Delphi as the centre of the world, and in ancient times, the city-states such as Athens, Siphnos and Thebes built treasuries and statues along the Sacred Way on the mountain to give thanks to Apollo but also as a show of their own wealth and might. 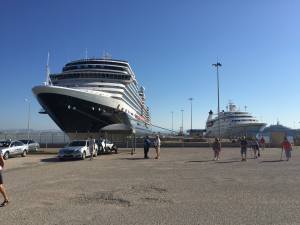 Star Legend is docked in Katakolon next to Holland America’s Eurodam. Our next port, Katakolon, overlooks the Ionian Sea and has a great shopping area next to the port. For some, this was the port to see Olympia, about 40 kms away and known as the site of the Olympic Games from the 8th to 4th centuries BC. We chose the shopping and after a delightful lunch aboard we joined all the passengers from Star Legend for the Destination Discovery Event. 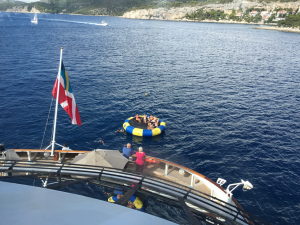 Windstar includes a special event for all passengers on each sailing. Our trip was to Magna Grecia, an agritourism farm with olive groves and vineyards. We heard from one of the owners about the farm before we were invited to a banquet including their own olive oils and wine with local produce and delicacies. After the meal the family and staff treated us to Greek dancing and invited the guests to dance with them. A real highlight of the cruise! 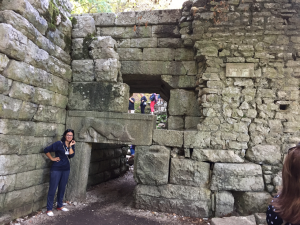 Our tour guide, Matilda, at the first gate of the fortress at Butrint. Sarande, Albania was our next stop. The night before we stopped, Windstar brought on one of the founders of the Butrint Foundation for a port talk. He was fascinating, especially since we had chosen a tour of Butrint National Park, a UNESCO World Heritage site protecting 94 square kms of historic landscape, archaeology and environment. The area was inhabited since prehistoric times and was a Greek city, then a Roman colony which fell into decline in the Middle Ages. Italy’s Fascist leader Mussolini, who was trying to recreate the Roman Empire, sent an archeologist to the site in 1928 to begin excavations which continued until 1944 when Albania banned foreigners from the site. UNESCO took over the site in 1992 after the collapse of communism. Albania has been open to tourists for just the past ten years. Our tour guide, Matilda, was a former teacher now completing her PhD. We heard that when the cruise ships come in, schools are often closed to allow the teachers to be the tour guides. Star Legend’s executive chef picking out prawns for the barbecue that night. Our next port was Kotor, Montenegro, located on the Bay of Kotor which is one of the most indented parts of the Adriatic Sea, which afforded us a picturesque sail through what looks like a fjord (although it is a ria, a submerged river canyon). 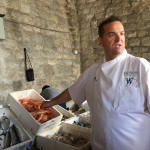 We were treated to a shopping tour with the ship’s executive chef in the market where he chose seafood, cheeses and prosciutto for the signature ship’s barbecue that evening. 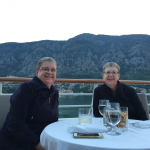 Laura and Julie enjoying the ship’s barbecue on the top deck of Star Legend in Kotor. Dubrovnik, Croatia was our third-last port. The old city has been impressively restored after it was besieged by Serb and Montenegrin soldiers after the breakup of Yugoslavia in 1991. It was in Dubrovnik that we were docked side by side with a sister power yacht, the Star Breeze, which was heading from Venice to Athens. Crew members took the opportunity to catch up with their friends from the other ship. The next day we visited the beautiful island of Hvar, Croatia. Hvar town is dominated by 13th century walls which surround marble traffic-free streets. Our excursion took us over the top of the hilly island to Starigrad, a UNESCO World Heritage site on a large bay. We went to the Dominican monastery which doubles as the local museum. We then sampled local cheeses and wine at a local taverna. On a warm day the crew opens the water sports bay at the back of the ship. Back at the ship, the water sports bay was open off the back, so we jumped in the Adriatic and had a swim! 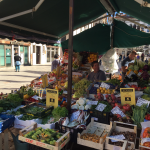 Our Venetian guide took us to her neighbourhood market. The second-last day of the trip brought us to Venice, Italy. We were to be docked overnight in Venice to allow guests more time to explore this beautiful city. Our city walking tour brought us to the head of the line to see the Basilica di San Marco – amazing that they could build and maintain such a huge and beautiful structure on a marsh! Our guide was born and raised a Venetian, and she took us on a tour of her neighbourhood away from the tourist sites. On our last night we dined in Candles, a special dining experience each guest can reserve at least once during a Windstar cruise. We watched the sun go down over the lagoon while enjoying spectacular food and drink. Small ship sailing has so much to recommend it, especially aboard Windstar. We enjoyed interacting with the crew who genuinely want to get to know you and are committed to ensuring you are having the experience you want. The intimate nature of the ship means you get to know some of the other passengers, but you can find your own quiet corner (at the very least in your huge stateroom). And who doesn’t want to sail on a yacht?